So as I’m preparing for a small group Bible study I’m leading at our house this weekend, I come across the story of Zacchaeus the Tax Collector as told in Luke 19. Some thoughts came to mind in how these verses play well into the theme I have going on in this series and I’d explore it a bit more here in this post. And this story convicted me today, because I know there are many ways I need to be more like Zacchaeus and like Jesus as portrayed here and I’m not even close at times. Let’s get started with verses 1 and 2 of Luke 19. Jesus entered Jericho and was passing through. A man was there by the name of Zacchaeus; he was a chief tax collector and was wealthy. Jesus had just performed a miracle by healing a blind man on the road to Jericho and he intended to pass through on his way to Bethany which was near Jerusalem. Jericho, being one of the chosen places of the priests. Jesus passed over their houses. To have a rabbi stay in your home would have been a great honor for any of them and they would have risen high in the ranks of prestige. But no Jesus passed by and this story is about Zacchaeus, not only a tax collector, but the chief tax collector. Tax collectors were hated in that day and he being the chief would have been collecting the taxes from all the other tax collectors to hand off to the Romans. He made himself rich, probably from skimming off the top and overcharging people on their taxes. Tax collectors in the day were seen as little more than criminals. He had heard about this Jesus and wanted to see what he was all about. The word of Jesus’ miracles was getting around and people were starting to wonder what He was all about. Most likely, when the blind man was healed on the road to Jericho, people ran ahead and told the story and it spread like wild-fire. So there was a great crowd awaiting Jesus and Zacchaeus wanted to see him so he did what he had to do, he climbed a tree to look above the crowd. How we talk about Jesus, can be enough to have someone catch a glimpse of him. As we live our lives, we are showing the fruit of the Gospel by our actions. That alone, could be enough to have someone come to see Jesus, without us saying a word. We are called to go and spread the gospel. But that does not mean we are all missionaries overseas or a pastor or standing on a street corner or going door to door handing out Bible tracts. No we are spreading the Gospel everyday in how we live, how we treat the least of us, how we speak to others, how we handle ourselves in different situations. We are doing good (or damaging) the gospel everyday without saying a word. We don’t know if Jesus had any prior personal knowledge of Zacchaeus or not. But I contend what Jesus did know was the higher knowledge of seeing him in his inner nature, in his heart, that Zacchaeus was seeking out Jesus. He knew that Zacchaeus was looking to see what this Jesus was all about and had an open heart willing to learn. And when Jesus spoke, Zacchaeus acted at once. Not only did Zacchaeus obey at once, he did so gladly. This seems to indicate a desire to commune with Jesus. To learn more about his teaching. Zacchaeus was thirsty for this saving knowledge. His heart was ready to receive Jesus. So he demonstrated his faith, but seeking Jesus and then welcoming him gladly when Jesus called to him. Be a friend of outcasts! There is a story about a new pastor to a church, where on the Sunday that we was to be introduced to the congregation, disguised himself as a homeless man. He walked around the church before the service began and only a handful of people out of thousands even said hello to him. When he asked for some change to buy food, no one gave him anything. Are we like that? Do we leave church on a Sunday only to pass by a homeless man? Do we look down on those that are poor or sick or in prison? Jesus stayed in the home of a criminal, a deplorable person in the eyes of the Jews. Are we sharing the true gospel of Jesus or are we just passing by? I like to think that Zacchaeus’ faith took over at this point. That in a spontaneous act of work born out of his faith, he gave half of his wealth away. Out of the other half he would repay all those he had cheated four times over. This seems to drastic to just be a ploy to look good in the eyes of Jesus in the moment. I feel it was something that wasn’t planned. We have never been great budgeters of our money. That is a discussion for a different time, as I think and wish we were better at it. But I love the joy of spontaneous giving. Those moments when we can give, not because it’s budgeted to give, but because of the promptings of God. Sometimes being in the presence of God will open up our hearts to give to those in need. We must be careful that we don’t fall into the trap of being in the presence of a human, in power or up on a pulpit who is asking us to give, because we don’t know what their motives are. But the gentle promptings that God puts on our hearts are often unmistakable for what they are and they often come at odd times and strange places. But not only should we give of our wealth, but of ourselves. God asks for the first fruits of all our crops. Our time, our talents and gifts, our possessions; all these things we should give freely of to those in need. Jesus credited Zacchaeus salvation, not because of his lineage (apparently non-Jewish) nor because of his works alone, but because he had the faith of Abraham. The faith that he had to seek out Jesus and then when in the presence of Jesus, welcomed him in and his life was never the same afterward. Not only did Jesus provide salvation from the penalty of sin, but also deliverance from the habit and the power of sin that Zacchaeus was in. Zacchaeus would not have given away over half of everything, only to go back to his sinful nature when Jesus was gone. He was a changed person. Not only are we saved from damnation when we receive Christ, but we also change in our habits as well. They may not manifest as suddenly as they did in Zacchaeus, but they will manifest in you. 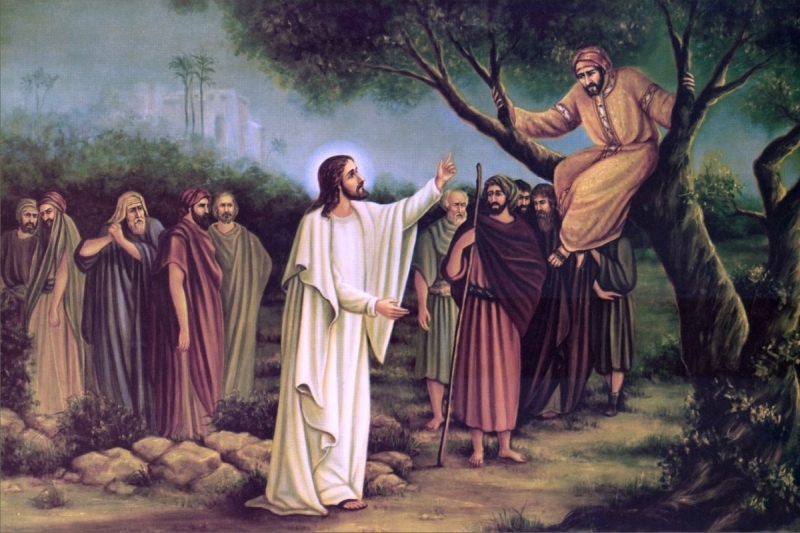 The faith that Zacchaeus had when seeking Jesus, the love of Jesus for welcoming a sinner, a criminal, a deplorable person in and then the example of Zacchaeus in his generosity and the usage of his possessions (ill-gained or God given) are an example for us all this Thanksgiving season and really all year round.